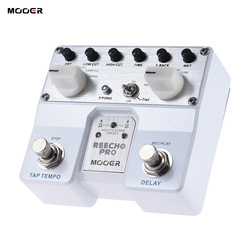 Home › Stringed Instruments › Guitar Parts & Accessories › MOOER Reecho Pro ..
Reecho Pro assembles 6 delay effects plus 3 additional effects which can be added to the delay effects, and with Tap Tempo function which makes adjusting the delay time much more easier. Moreover, Reecho Pro have separated dry and wet level control, high cut and low cut control, PINGPONG function, Loop function, stereo input and stereo output, preset saving function. No matter you use it in practicing or professional performance, Reecho Pro will give you a much wider space for your playing.